OPEC is cutting oil production more than it promised, according to former Saudi Aramco executive Sadad al-Husseini. The 14-member producer group could remove about 1 million barrels per day from the market by the end of January, Husseini says. OPEC agreed to slash output by 800,000 bpd last month to prevent a price-crushing supply glut in the oil market. An worker on offshore oil rig 'Marjan 2' in March 2003, located in the Persian Gulf, Saudi Arabia. The 14-member oil producer group will likely deliver a deeper output cut in January than it promised last month, said Sadad al-Husseini, founder of Husseini Energy. Market analysts could see OPEC production fall by about 1 million barrels per day from October levels this month, Husseini said. Last month, OPEC agreed to take 800,000 bpd off the market. Pledges from 10 other producers aligned with OPEC, including Russia, brought total output cuts to 1.2 million bpd. "It's working very well," Husseini told CNBC's "Squawk on the Street" on Thursday. "There's already been a significant drop in OPEC production and it's continuing on target to come down to about 32 [million] and 100,000 barrels in January." OPEC pumped just under 33 million bpd in October, the month that serves as the benchmark for production cuts. If Husseini's forecast is correct and OPEC pumps roughly 32.1 million bpd in January, it would equal a reduction of 876,000 bpd. But Husseini said it's possible that OPEC cuts more than 1 million bpd by the end of January, and the group could potentially throttle back output by nearly 1.2 million bpd, essentially doing the work of its allies for them. Husseini is former executive vice president of exploration and production operations at Saudi Arabia's state-owned oil company Aramco. Saudi Arabia is OPEC's top oil producer and the world's biggest crude exporter. There are already signs that OPEC will over deliver in January, the month its production deal begins. Saudi Oil Minister Khalid al-Falih said last month that Saudi Arabia will pump about 10.2 million bpd in January, down from nearly 11.1 million bpd in November, according to the kingdom's figures. That represents a bigger drop than the 3 percent cut from October levels that 11 participating OPEC members are reportedly being asked to shoulder. Three members — Iran, Libya and Venezuela — are exempt. The Saudis consistently reduced production more than required throughout OPEC's initial deal with its allies to cap output, which ran from January 2017 to June 2018. The alliance agreed to reverse course and hike production in June as U.S. sanctions on Iran threatened to leave the world short of oil supplies. However, President Donald Trump granted exemptions to some of Iran's biggest customers when sanctions snapped back into place in November. The move came just as a big slug of OPEC supply was hitting the market. That deepened a sharp slide in oil prices. "Clearly there was an excess supply. This was largely due to the plans to impose sanctions on Iran that were supposed to be very stringent," Husseini said. On Wednesday, oil prices rallied on Bloomberg data that indicated Saudi exports fell by 464,000 bpd in December. 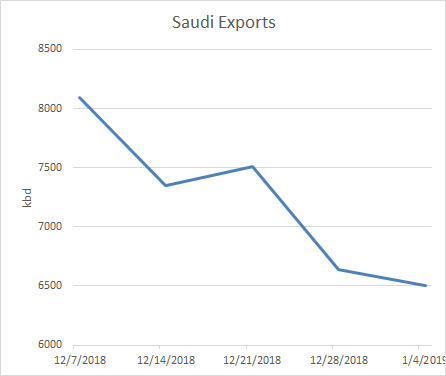 Saudi shipments have fallen by about 1.5 million bpd in the four weeks since OPEC struck the production deal, according to tanker-tracking figures from ClipperData. On Thursday, a Reuters survey suggested Saudi output fell by 400,000 bpd and OPEC's production was down 460,000 bpd in December. OPEC releases its official report on December output in two weeks. A first reading of January production is scheduled for Feb. 12.